How do I choose blue dice? There will be a pledge manager after the campaign ends when you can choose which colors you want. For each boxed set, you will be able to choose either green or blue. And yes, there will be blue original dice available as well. For the Deluxe, you can choose a bag and two regular boxes in different colors if you want. 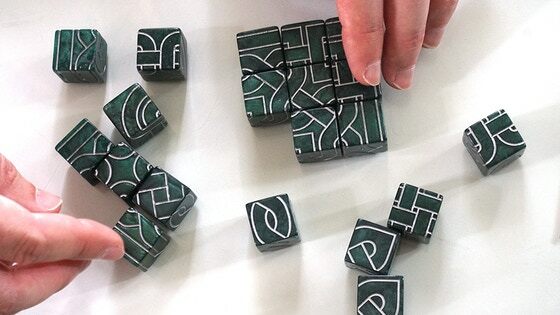 Why isn't there a Knot Dice Squared Deluxe? There is, I just didn't use that name, because it doesn't have its own packaging like the original Knot Dice Deluxe. The Deluxe level is Knot Dice Squared x2, because it is the right number to add if you already have Knot Dice Deluxe. It even includes a bag like the original Deluxe. The Knot Dice Squared Deluxe Complete level has the original Deluxe, plus everything in Knot Dice Squared x2. The only reason I don't have it packaged in a single Knot Dice Squared Deluxe box is that there are just too many dice to fit in the box! How do I choose blue dice? Why isn't there a Knot Dice Squared Deluxe? I want to know when my reward is shipping. I am having trouble filling out my survey. I would like to make a change to my pledge. I would like help with preorders. I have a issue with my pledge finances. I have a question for the project creator. I have a question not listed here. I want a refund for my initial campaign pledge. I have a question about BackerKit.